Bill Cox's lively list - join now! Bill Cox's great site, Patsy Cline, The Lady and the Legend -- includes discography and tons of useful information as well as the "Cline Chronicle" Check it out now! Patsified! - By Lisa (the Homesick Texan) - this site is full of surprises and opportunities to give feedback and your thoughts on the Cline, message boards and more! CHECK IT OUT, NOW - you won't be disappointed! Honky Tonk Angel - by Ellis Nassour. 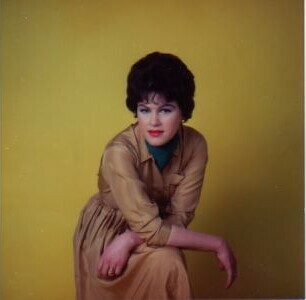 Visit the site by the author of THE definitive Patsy Cline biography! Lots of neat stuff here. A wonderful site by Joan Searson from Australia. I am sad to report that we have received word that Joan Searson passed away in Australia on October 8, 2003. I don't know how long her site will remain, but I will keep the link here as long as it is active. Our deepest sympathy to Joan's family and friends. Buy Patsy Cline, Hawkshaw Hawkins and Cowboy Copas music here from the on-line store -- Also books and videos. The Official "Jordanaires" Website. These guys backed up Patsy on all of her hit records. Johnny Franklin's "Patsy and Friends" site, loaded with lots and lots of pictures of Patsy and Johnny's other "angels" Check it Out! You won't be dissapointed! Note: Johnny Franklin's website is still up and running but no one has had any contact with him for some time and I believe he may have passed away. To date, I have been unable to verify this. If anyone has information I would greatly appreciate an e-mail. I had the pleasure of speaking with Johnny on the phone several times and corresponding with him and I helped him out when he first put his website together. I would really like to know what happened to him, so please, if anyone reading this has any info, contact me. Thanks. A Delicious Treat! Sue Bee's Recipie Page - Dedicated to Patsy - With Special Recipies of the Week! Check it out! A Yummy site. A Fan's Tribute - Per Jonsson's site from Sweden, loaded with Patsy info, pictures, discography and other neat stuff, including the "Fan Forum" where fans can discuss Patsy. This site was the inspiration for my own! Gary's Traditional Country Music Site - Hawk, Copas, Patsy (of course!) and all the other Legends of Country Music - One of my favorite traditional country music sites on the net. Check it out! Marlene's Gospel Music - Marlene Gilliam is Hawkshaw Hawkins' daughter. The A-Team - these are the guys who played on all of Patsy's recordings -- check it out! WOW! - What a boost this guy gave to Patsy's career! Not a Patsy Cline site, but, the webmaster, Bill Cox is a Patsy Cline Fan Club Member, friend of Patsy, and friend of mine. Check it out, especially if you like old cars! Yes, fans, there's plenty out there on the web about Patsy and her music. I know I don't have them all listed here, by any means. If you discover that any of these are "dead" links, please let me know so that I can either update or remove them. If you have a Patsy Cline site of your own, or if you know of one that I don't list above, please send me an e-mail and let me know. Thanks!